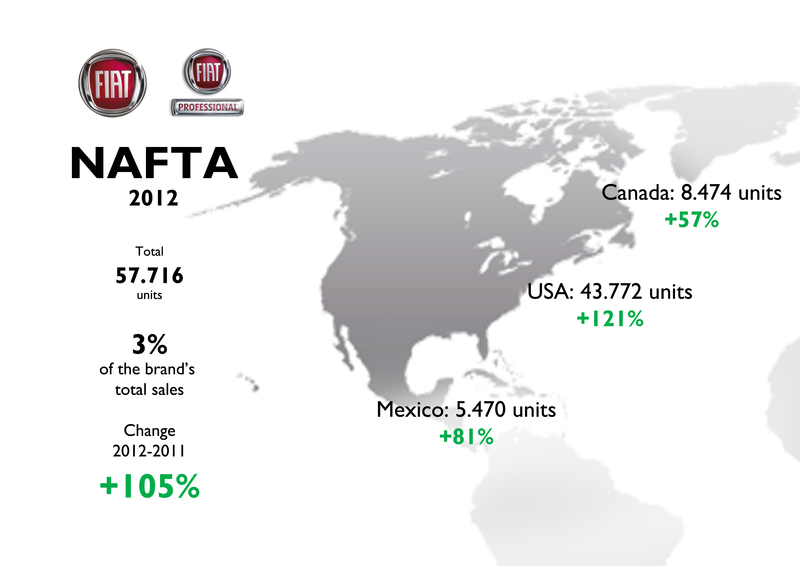 2012 wasn’t the best year for Fiat brand. It had problems in most of the European markets, and Brazil got more complicated. Meanwhile, the brand struggled to survive in Russia and India, while it started local production in China. I was able to collect information for 72 countries which totalled 4.194.437 units for the whole group: Alfa Romeo, Chrysler brand, Dodge, Ferrari, Fiat, Fiat Professional, Jeep, Lancia, Maserati and Ram. This data is for country and brands only. It means that my research counts for 99,65% of total units sold by Fiat-Chrysler in 2012: 4.209.000 units. From that total, Fiat and Fiat Professional count for 44,3%. Unfortunately it is not possible to have the exact number for Fiat brand and its commercial division, as in some countries they are unified into Fiat only. This analysis, the first by brand, will include Fiat Professional numbers in those of Fiat, and will show both results for those markets where the information was available. This brand counted for 44% of the whole group sales in 2012. It means it is the best-selling brand with 1,86 million units. 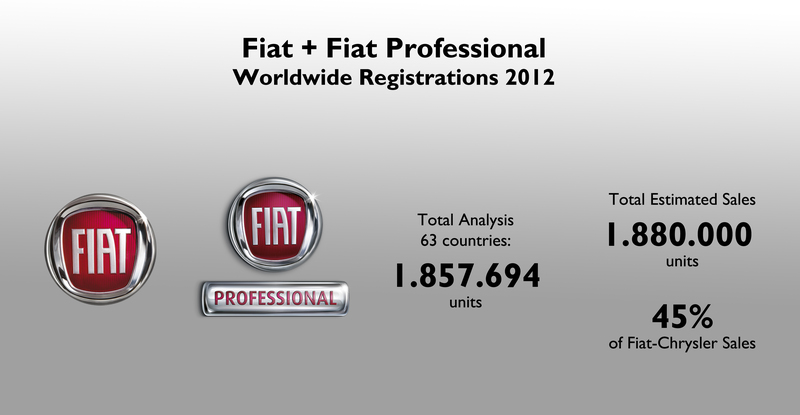 Though there isn’t complete information for 2011, Fiat + Fiat Professional sales had a tiny growth in 2012. This is because, as it was cited above, the brand had big problems in Europe (-10% circa), but its results in Brazil were up 11%. USA market contributed to enlarge Fiat numbers, and in the opposite side, Russia and India had big falls. China had an enormous jump thanks to the introduction of the Viaggio. 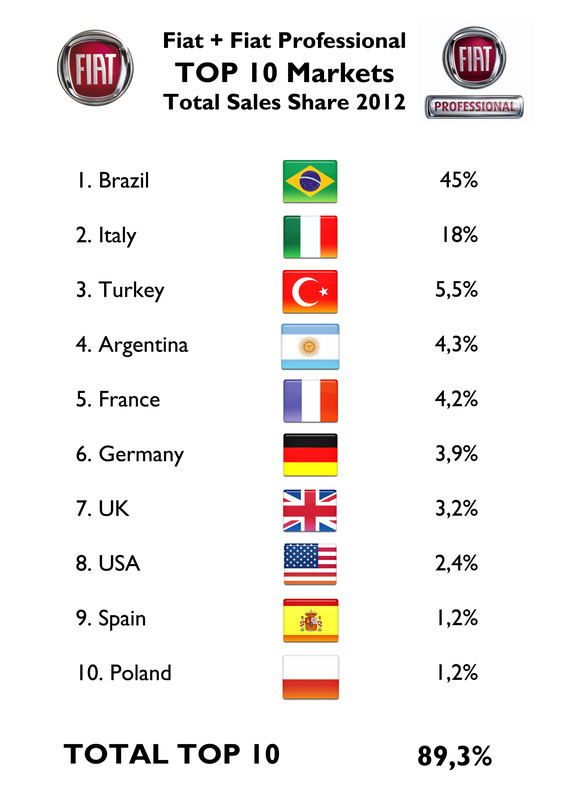 Nevertheless the brand’s registrations are extremely concentrated in few markets: Brazil counts for almost half of sales, and is followed by Italy with a big gap. 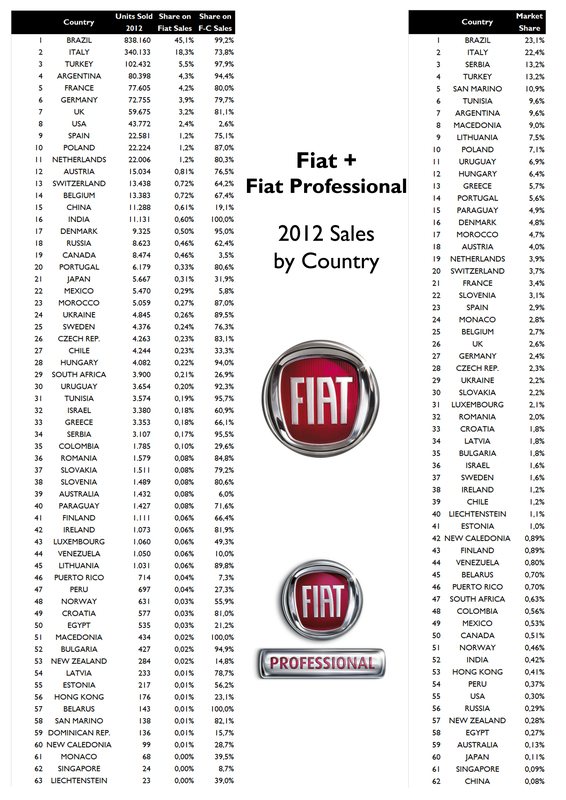 Yes, Fiat’s homeland and Brazil are very important for the brand, but looking at its competitors from Europe, their situation is a bit more balanced in terms of sales by country. Generally speaking, Fiat’s image all over the markets it is present is quite the same: small and efficient cars with some quality problems. There are few exceptions like Argentina (thanks to the last years’ events Fiat is now more positioned as a chic European car brand: ‘la nueva Fiat’), USA (the 500 means Fiat: Italian style, personality), or even Brazil (where consumers don’t misjudge the brand as it happens in Europe). 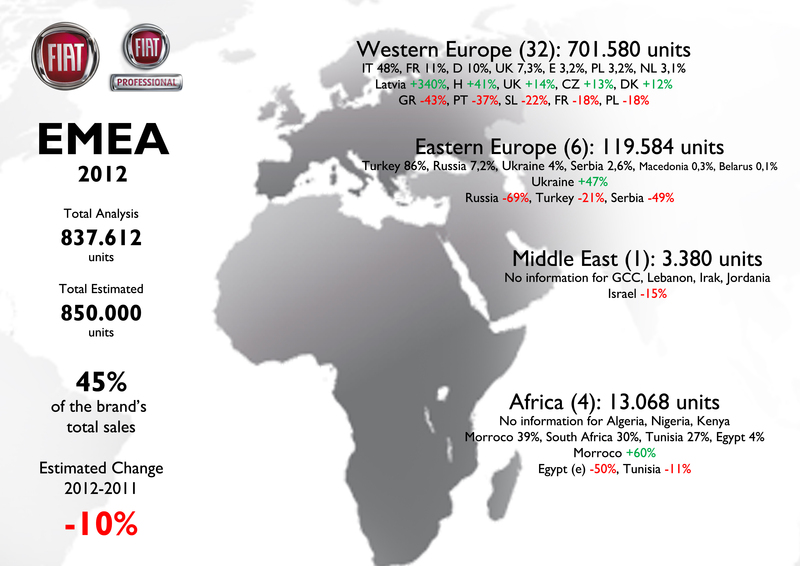 Fiat brand sold around 845.000-850.000 units in EMEA region last year. No precise data for the exact fall, but it was certainly big (around 100.000 units). The reason for this bad result is well-known by everyone: European debt crisis plus Italian car industry crisis plus fewer investments (less new models). That’s how the brand lost market share as the 500’s and Panda’s excellent performance wasn’t enough to offset the Punto’s disaster and the slowly death of the Bravo. 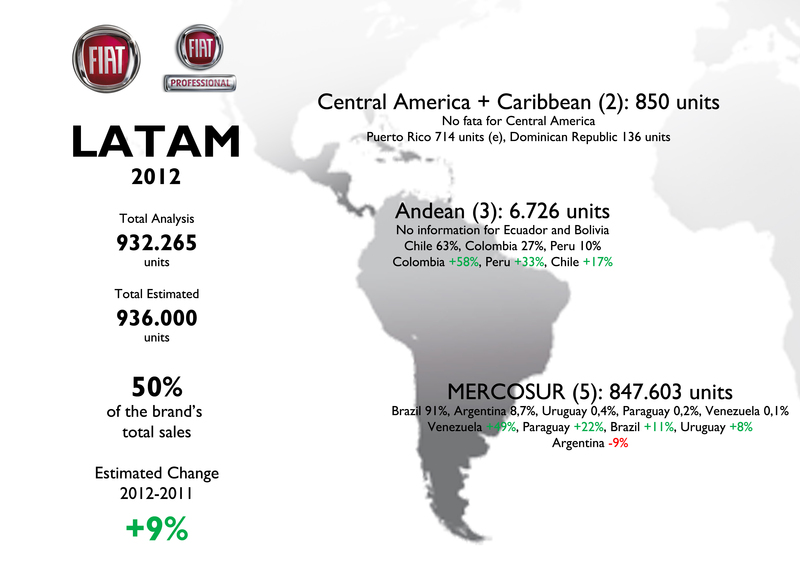 Latin America is the largest region for Fiat cars with more than 930.000 units. In terms of sales distribution it is the region with the highest concentration: Brazil counts for almost 90% of total sales (Mexico is not included). This is worse than the dependence on Italy in Europe. It can be explained by two different facts: Brazilian market continues to grow and therefore Fiat’s production is mainly headed to this country. And second, as it is strong in Brazil (and somehow in Argentina) it is weak in the remaining Latin American countries. That’s too bad because they just concentrate the efforts in one market (yes, the largest one), and don’t do the best to gain more market share. In 2012 Fiat made possible what Marchionne wanted since the brand was reintroduced in USA in 2011. 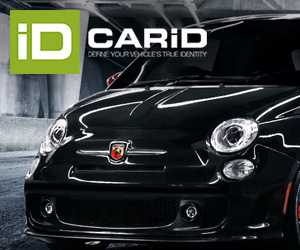 The brand sold more than 57.000 units last year, or 7 thousand units above Marchionne’s goal. Here the situation is extremely different from what happens in Europe: the brand is positioned in another way and the 500 counts for almost all of the sales (in Mexico Fiat sells other models as well). Actually USA, Canada and Mexico totalled much more than all Latin American countries (without Brazil and Argentina). Fiat is very unpopular in Asia. The brand had a terrible year in India, which was its largest market until 2011. 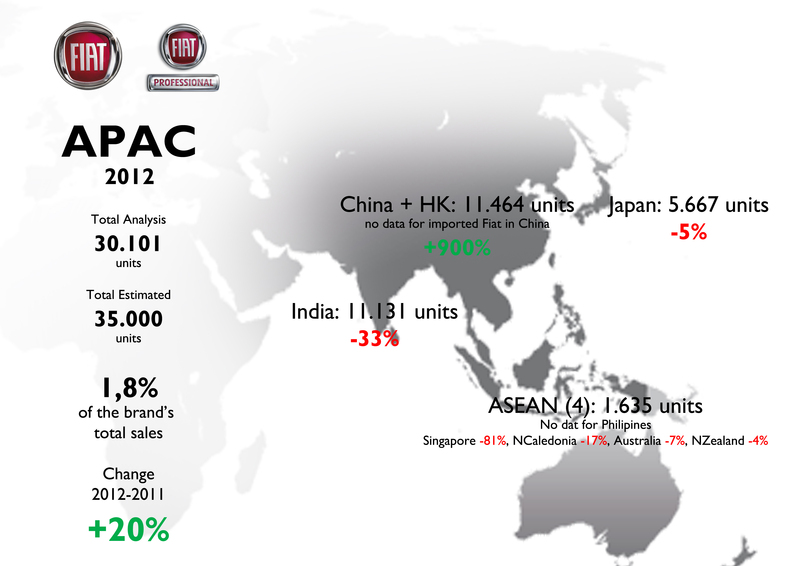 Last year, thanks to the locally produced Viaggio, China became the largest market in Asia for Fiat brand. The brand is also well appreciated in Japan (thanks to the 500). In Australia is not popular at all while in South Korea, it wasn’t present (the brand was introduced in March 2013). Very use full analysis, please give more analsyis about Linea. We are purchasing this car. Thanks Roy. Good to know you will buy a Linea, it’s an excellent mid-size sedan.